On 15th February Army Cadets from Wadebridge in Cornwall spent a day of their school half term holidays planting young trees for The Queen's Diamond Jubilee Woods Programme. 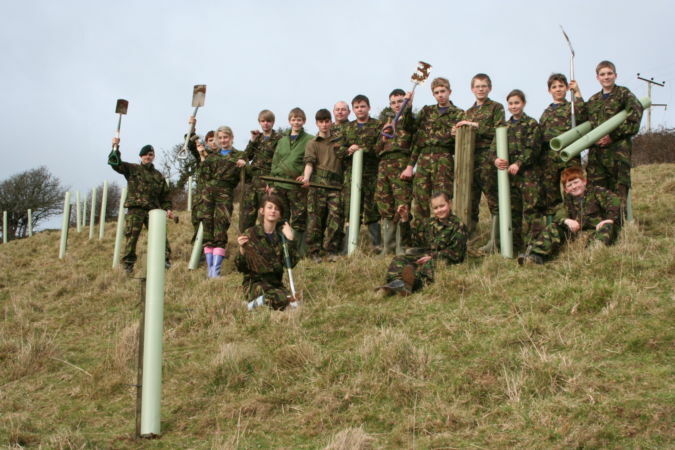 Supervised by Malcolm Allen and Michelle Byrne of The Woodland Trust, the cadets planted a variety of tree types including oak, ash, field maple, spindle, crab apple, alder and hazel, each with a sleeves to protect them from young wildlife. Permission for the planting, which took place at Archer Farm, Port Isaac in Cornwall was granted by Commodore A J G Miller CBE RN Naval Regional Officer and his wife Mrs Jamie Miller. Mrs Miller said she was "most impressed by the conduct of the boys and girls who undertook to plant so many young trees, and of their politeness and good manners." After planting 1500 trees the cadets went home feeling tired but proud of their significant contribution in planting a large area of land in their community. Colonel Frank Hewitt from the Woodland Trust said "Cadets carried out their tasks in a splendid and efficient manner and their contribution is much appreciated." Cadets from Lancashire, Shropshire, Durham, Greater Manchester, Hereford and Worcester, Gwent and Powys, Dyfed and Glamorgan ACF's have also already carried out or will carry out plantings during the current planting season (ending March 2012).The majority of plantings will take place during the November 2012 to March 2013 planting season. Colonel Frank Hewitt from the Woodland Trust has again volunteered to co-ordinate the ACF's participation, he will inform County HQs when planting opportunities arise and give as much notice as possible. The project will include the planting of sixty major Diamond Woods each of about sixty acres, as well as a much larger number of smaller Jubilee woods and copses, similar in size to many of those planted by cadets as part of Cadet150. There will again be an opportunity at the end of the year for ACF Counties to participate at a lower level by applying for tree packs (containing either 105 or 420 trees), which can be planted by local arrangement on public, private, ACF or MOD land.